New data has revealed disparities across the world when it comes to access to treatment and care for cancer. The revamped International Atomic Energy Agency (IAEA) database released recently presents a disappointing state of cancer care in India. The country records 1,014,934 cancer cases. It has 332 radiotherapy (RT) centres, according to the report and 554 RT machines. However, 25 per cent of these machines are older than 30 years and need to be replaced, the report says. According to the Department of Atomic Energy (DAE), each machine costs at least around Rs 7-8 crore. Going by this rate, India will have to spend at least Rs 1,064 crore in purchasing new machines. India has around 332 comprehensive cancer centres offering multi-modal treatment options but these are mainly concentrated in metros. A majority of these centres are owned by private and corporate bodies. The poor geographical distribution of such centres limits access to advanced and multi-modal treatment for patients. The list of cancer treatment centres licensed by the Atomic Energy Regulatory Board proves this. India needs one RT machine per million population and needs at least 1,000 such machines for cancer treatment, says the DAE. But not even one machine is available per million population, as revealed by the IAEA database. The huge gap between availability and requirement of RT machines is of great concern. 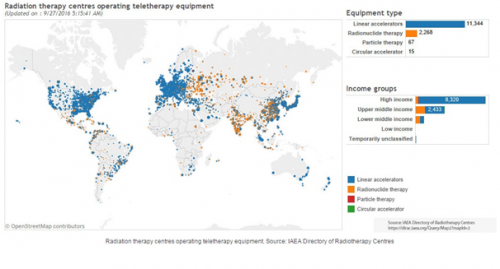 Most RT facilities in the world are located in high-income countries and at least 36 nations do not have RT machines to treat cancer, data in the revamped Directory of Radiotherapy Centres (DIRAC) launched two days ago shows. Having information from 141 countries, DIRAC is the most comprehensive database on RT infrastructure worldwide, showing centres where cancer can be treated and drawing attention to locations where patients have limited or no access to cancer care at all. It also highlights the current and future needs in cancer care. The interactive database shows that thousands of additional RT machines and substantial staff training are required to cover the current gap in access to treatment in low-and middle-income countries. “Professionals worldwide rely on DIRAC and request information every day. It is a powerful tool for planning radiotherapy services and for advocating better access to cancer treatment in developing countries,” Joanna Izewska, head of the IAEA Dosimetry Laboratory in charge of DIRAC, said. According to India’s National Health Profile 2015 , cancer in men will rise by 19 per cent by 2020, with mouth cancer registering the highest increase. In women, cancer cases will go up by 23 per cent. 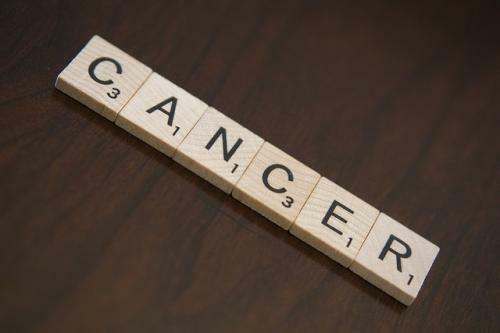 Around 700,000 people die of cancer in India annually. It is projected to rise to around 1.2 million deaths in 2035 annually. Under such a scenario, the infrastructure for cancer treatment needs to be scaled up rapidly. At the same time, the government must consider setting up guidelines to regulate efficient and effective treatment of cancer in the country. Such guidelines ought to make cancer centres accountable and transparent in publishing their data online on a regular basis. For instance, the National Health Service in the UK has regulations that cancer treatment has to start within two weeks. Trusts are penalised if they do not deliver or do not publish certain key outcome measures like cancer or treatment-related deaths, hospital-acquired infections and survival after treatment. The IAEA data shows that despite efforts to improve the situation in recent years, a lot is still needed to provide adequate access to cancer care. Political commitment is at the heart of the solution to control India’s growing cancer burden.